Day 02: Guided city tour of Chennai. Day 03: Drive to Pondy,visiting Kanchipuram/Mahabalipuram enroute. Day 04: Pondy sightseeing, Visit Aurobindo Ashram & Auroville. Day 05: Drive to Thanjavur. Visit town & temples. Day 07: Guided tour of Madurai. Eve at leisure. Day 08: Drive to Thekkady/ Periyar Reserve. Game viewing or at leisure. Day 10: Drive to Kumarakom on the banks of Vembanad Lake. Serene & picturesque. Day 11: At Kumarakom to relax and chill out by the lake shore. Try Ayurveda. Day 12: Board houseboat for overnight cruise to Alleppey with crew & facilities. Day 13: Disembark houseboat & drive to Cochin. 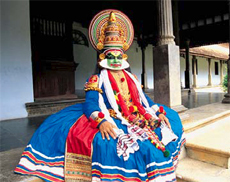 Eve, Kathakali dance performance. Day 14: Guided tour of Cochin and the heritage areas, sunset cruise. Day 15: Transfer to Cochin Airport for flight back to UK/Europe. Although Portuguese and Armenian communities already inhabited India`s eastern coast, it was the British who shaped the town they called Madras. Arriving in 1639, the British turned a strip of local villages into India`s major city, leaving an eclectic blend of architecture ranging from the 17th century Fort St George to the railway station, a fine example of Indo-Saracenic Victorian construction. Of course, Tamil Nadu`s history predates its colonial heritage and the Kapaleeswarar Temple, with its towering gopuram of brightly painted figures and busy shrines, or the collection of 9th-12th century Chola bronzes in the Government Museum, exemplify this legacy. 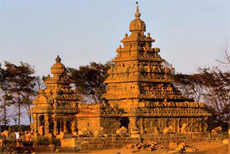 Mahabalipuram is a historical retreat set amidst natural beauty. This ancient seaport of the Pallava dynasty invites connoisseurs of art. Its monuments hewn out of slid rock, though ravaged by the sea and wind, still bear testimony to the magnificent heritage of Dravidian architecture. Arriving in Pondicherry feels like stepping into France as you see the typical blue road signs, police with gendarme caps and tax-free wine. The city has much more to offer than just its colonial past and the restoration of the traditional Tamil merchants` houses is visible on a gentle guided stroll around the centre, ending with an evening promenade along the seafront past the huge statue of Gandhi. Outside Pondicherry is one of the most unusual small towns in India, the international community of Auroville, whose members seek an alternative lifestyle. Visit and you will be able to see an interesting exhibition and learn about the various projects that the community undertakes, including environmental regeneration and health care. Some visitors to Trichy do little more than climb to the Rock Temple with its inspiring views over the city, but there is plenty more of interest. 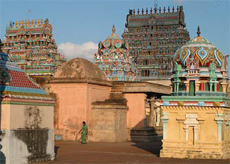 The temple at Srirangam is enclosed by seven concentric walls, with each section inhabited by a different caste. 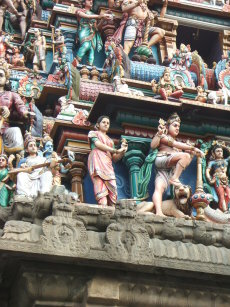 The best views of the brightly painted temple towers are from the roof, where you can clearly see the intricate and sometimes grotesque figures. Beside the Cauvery River outside Trichy you may witness fascinating ceremonies, with children being dedicated to Shiva and offerings being made in the quest to find a wife. Tanjore is best known for its 1,000-year-old Brihadishwara Temple built by King Rajaraja I and dedicated to the god Shiva. Now a World Heritage Site, its gopurams tower above your approach through its manicured gardens. The architectural achievement is impressive with an 80-tonne granite block capping the 60-metre high inner temple. The Nayak Palace, although rather dishevelled, is also worth investigating for its superb Chola bronze collection and elaborately decorated Durbar Hall. 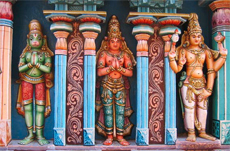 Madurai is a temple town like no other, with the huge Meenakshi Temple being virtually a town in itself. Built at the same time as the Taj Mahal, it is an outstanding example of south Indian Hindu architecture with nine towering gopurams smothered in a riot of colourful stucco images. This is an amazing place to absorb the atmosphere of Hinduism, with the dark pillared halls filled with thousands of pilgrims, bare-chested priests and the scent of flowers, coconut and ghee. Elsewhere in the city the Gandhi Museum chronicles the life of the great Indian leader and exhibits the blood-stained dhoti the Mahatma was wearing when he was assassinated. Set high in the ranges of the Western Ghats, in God`s Own Country, Kerala, is the Periyar National Park and Tiger Reserve. Periyar wildlife sanctuary has a picturesque lake at the heart of the sanctuary. Formed with the building of a dam in 1895, this reservoir meanders around the contours of the wooded hills, providing a permanent source of water for the local wildlife. Though its a Tiger Reserve, tourists come here to view the Indian elephants in the act of ablution and playfulness by the Periyar lake. Kumarakom the village of Kumarakom is a cluster of little islands on the Vembanad Lake, and this small water world is part of the Kuttanad region. The bird sanctuary here, which is spread across 14 acres, is a favorite haunt of migratory birds and an ornithologist`s paradise. Egrets, darters, herons, teal, waterfowl, cuckoo, wild duck and migratory birds like the Siberian stork that live there in flocks are a fascination for visitors. The best way to watch the birds of the Kumarokom sanctuary is a boat trip round the islands. The principal port for southwestern India, Cochin has been a trading post for centuries and the Portuguese, Dutch and British influences remain evident. 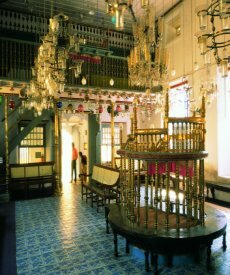 The city is a series of islands but it is the Mattancherry Palace with its detailed frescos, the old spice warehouses, the Jewish synagogue and the churches in Fort Cochin that will occupy most of your time. The Fort area retains a colonial charm with wide tree lined streets and a large central parade ground surrounded by grand buildings. The huge Chinese fishing nets that cantilever over the shallows are the indelible image of Cochin. Best viewed on an evening boat cruise, they are still in daily use by the dedicated fishermen and their catch can be tried in the numerous food stalls that line the waters edge or in the more comfortable surroundings of a hotel restaurant. A visit to a Kathakali dance centre to watch this stylised and theatrical art form retelling stories from Hindu legend is recommended. 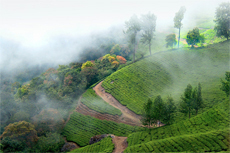 Discover the real Kerala & South India enjoying the hospitality of pukka families in tranquil country retreats, plantation bungalows, villages, backwaters and towns, which offers a unique and truly rewarding experience. Each home an oasis of comfort, a haven of peace and tranquility in some wonderfully quiet corners of Kerala & South India. 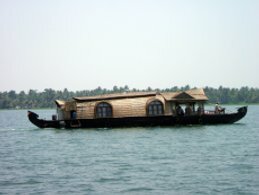 For discerning travellers / families who want to get more out of their tailormade holiday in Kerala / South India, a Homestay offers a unique and rewarding experience. 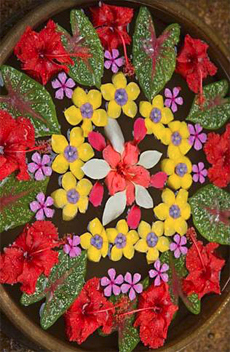 One gets the opportunity to live and interact with local families, learn more about the culture, sample local fare, and experience the leisurely pace of life in pastoral Kerala and South India while taking in the sights and sounds of the region at your own pace. Homestays are available all over Kerala / South India which can be combined with heritage hotels, beach & ayurvedic resorts as part of your tailormade `pukka holiday` itinerary in the region.